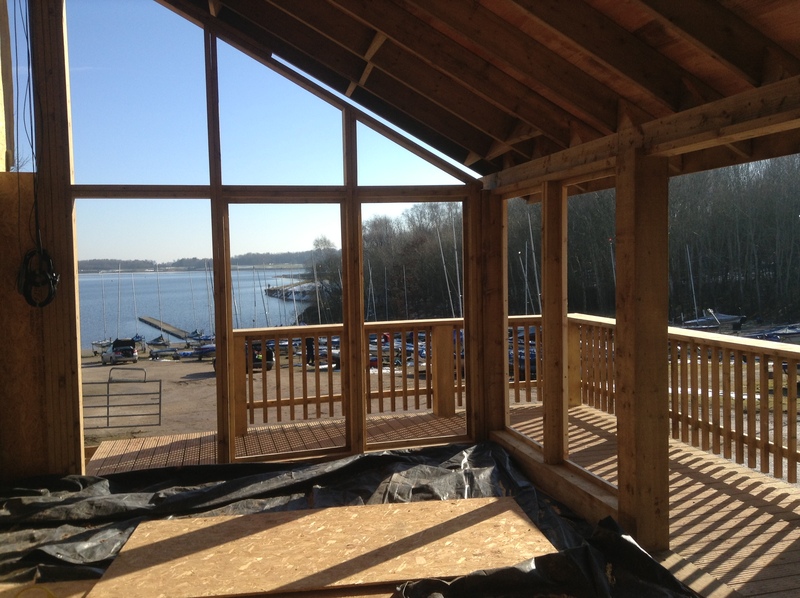 It has been just over a year since the completion of Burton Sailing Club Training Centre. The training centre has been a great success and has allowed for a tremendous increase in training at the club. 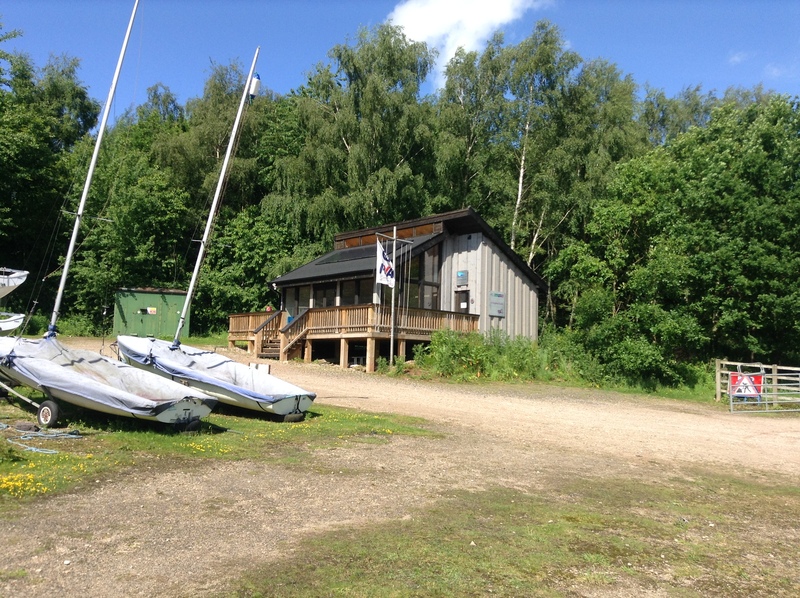 The centre has been used nearly every day, providing varied training opportunities. 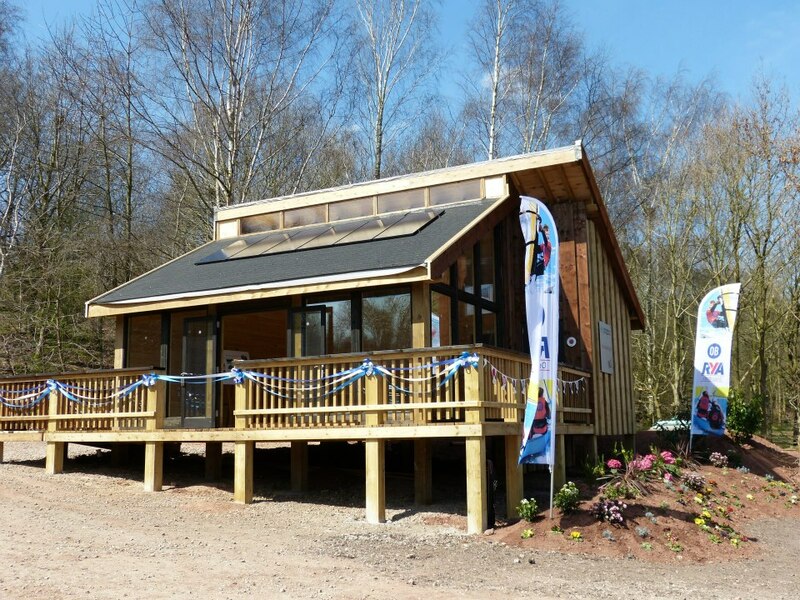 Im very happy to say that the off grid service systems have all been very successful even with the increase in use and the club has adapted very successfully to accommodate them. A year on i am still receiving compliments about the centre. My favourite one was hearing an anecdote about a child who had come off the water because he was cold and a bit fed up, often when this happens the child will not want to carry on sailing. However, after a few minutes break and time to warm up in the training centre this child was all fired up, ready to go again. 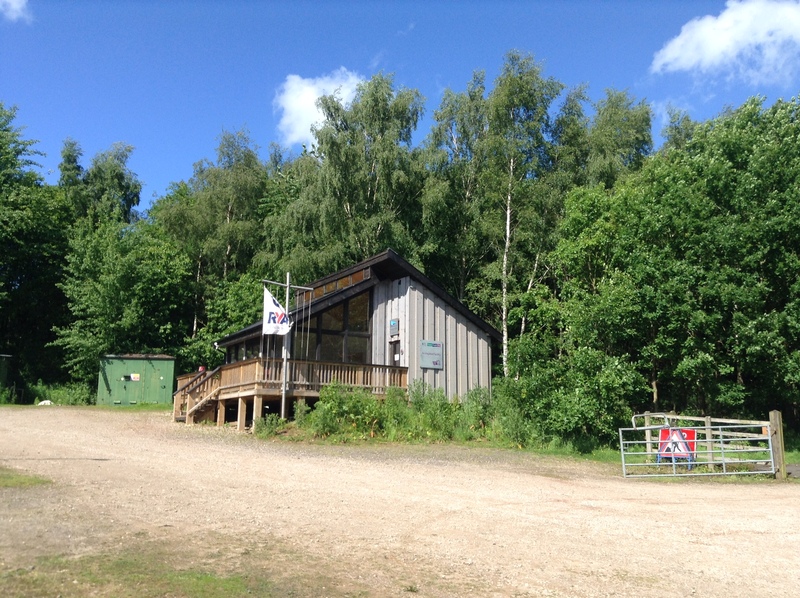 The instructor said that they felt the sole reason for this was the close proximity and positive atmosphere the training centre has. To me, that is the greatest achievement spatial design can have. I am really happy with the way the building has settled so well in to its surroundings and how nature is thriving around it. There are rabbits and squirrels using the shelter underneath the building and it has even attracted a hornets nest. Im not sure hornets are a good thing when children are around but enhancing biodiversity has certainly been achieved! 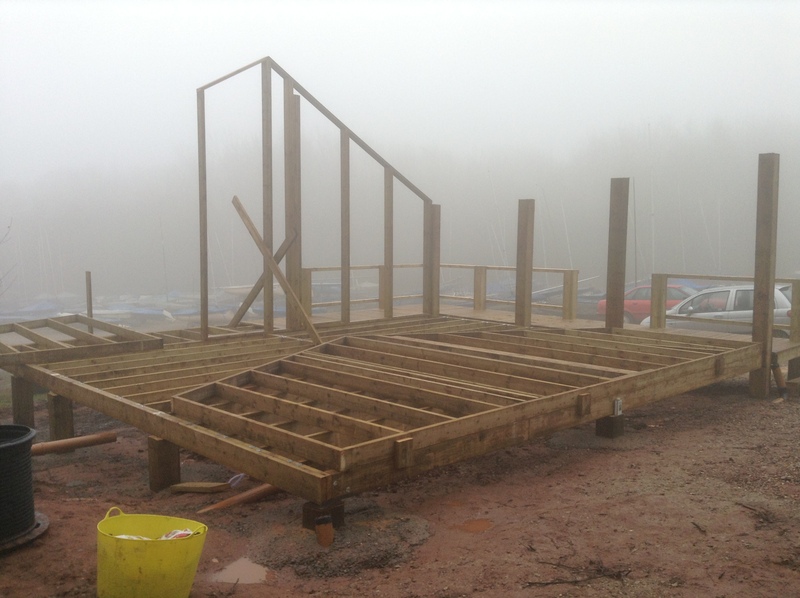 I think the project has been a great success and i feel that it is really working well within its surroundings and for the sailing club. Thanks to every one involved, I hope that centre continues to serve the club well for many years to come. Great progress was made in the week of construction before the opening ceremony. 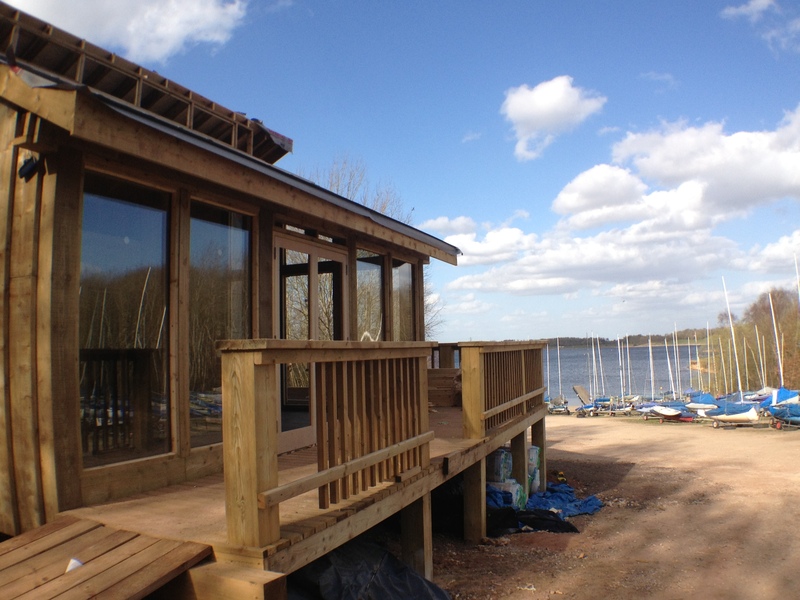 The solar panels went up and within a few hours were powering all the internal lighting, the access ramp was constructucted, the high level window frames and temporary glazing was fitted, the inside was finished and trimmed, and painting began on the window frames. 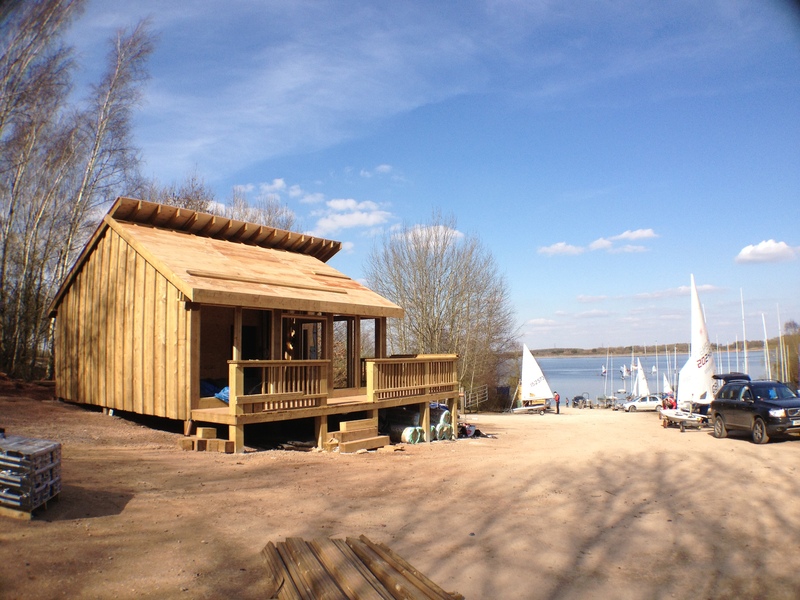 Unfortunately the build wasn’t completed for the opening, but the sun came and and it looked beautiful all the same. The Opening was a great success, the sun was shining and lots of people came to witness Tracy Edwards MBE cut the ribbon and pronounce the centre open. 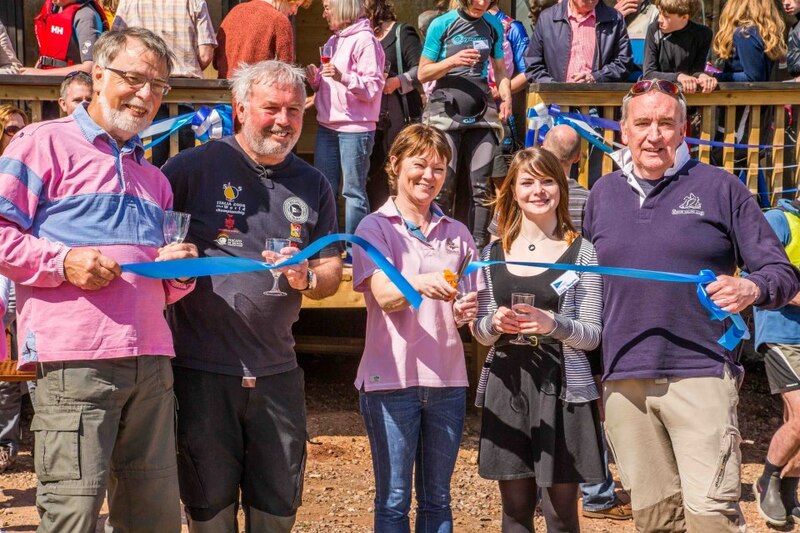 Photo above- cutting the ribbon, from the left Mike Hampton- project manager, Dave Bell- Commodore BSC committee, Tracy Edwards MBE, Chloe Hampton- Designer, Keith Pallet- BSC training principle. It was a great honour to be part of the day and to be recognised for the efforts of the design and build, everyone was very complimentary and i am really happy with the progress of the build. It is much better than i had imagined and i look forward to the centre being completed in the next few weeks. Sorry for the late post for construction week 8, I have been very busy with my final uni presentation. As it is now mid way through week 9, this post is a combination of last weeks visits and my site visit yesterday. 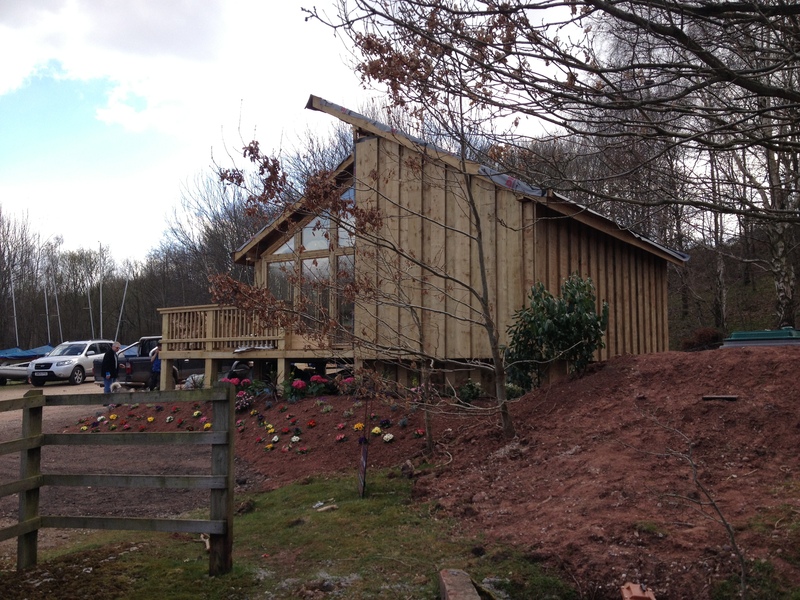 This photo was taken on friday when the glazing was being fitted. Its looking really nice, i love the reflection of the trees on this photo. 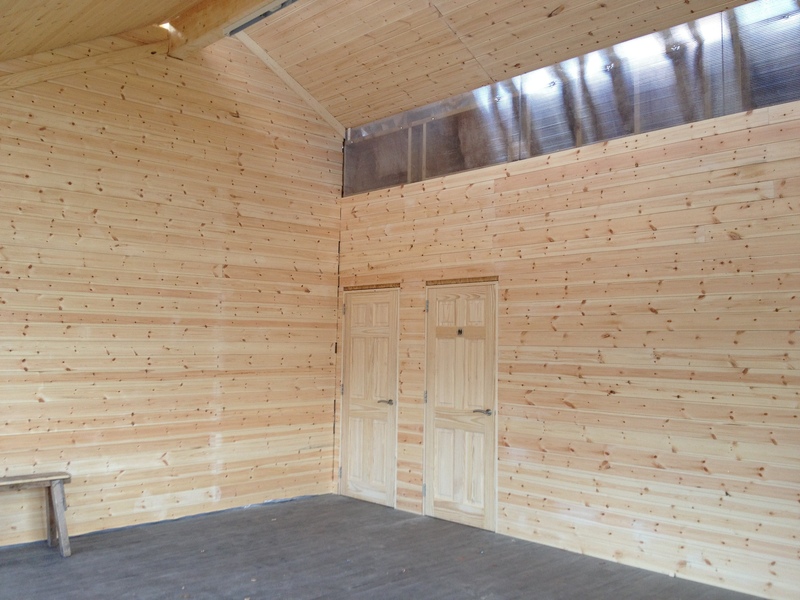 The interior tongue and grove cladding has all bee fitted, it looks great. The polycarbonate window in the buffer wall has been fitted, and im very happy to say that is does bring enough light into the toilets and lobby, enough to see anyway. 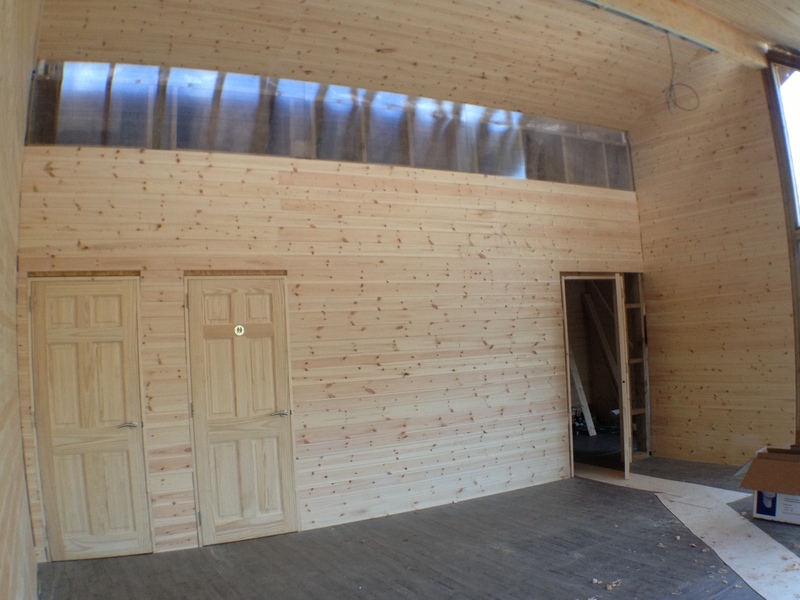 The photos below were taken on Tuesday as i had a wide angle lens and better photos of the interior. Since friday the laminate floor has been fitted. Over the past two days progress has been excellent. 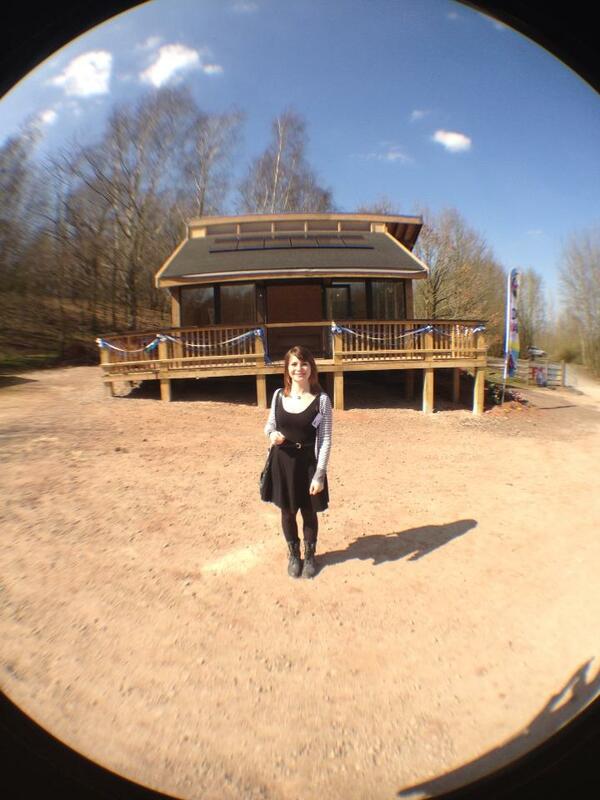 My visit yesterday has made me less worried about it finishing on time for saturdays opening. Theres now only 3 days work left to go. 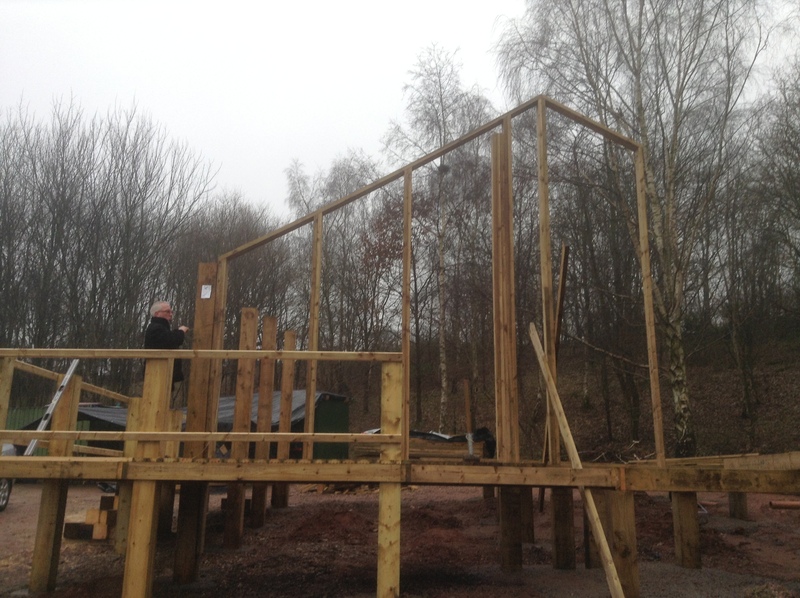 So far this week, the high level window frames have been fitted and look lovely. The toilets have been plumbed in. The roof tiles have all been fitted ready for the solar panels to go on today. A club member has kindly spent a lot of time doing some landscaping around the north and east sides of the build which has made a big difference and grounds the building into the site. With the glazing and the roof on its all beginning to come together, and im very much looking forward to the opening on saturday. 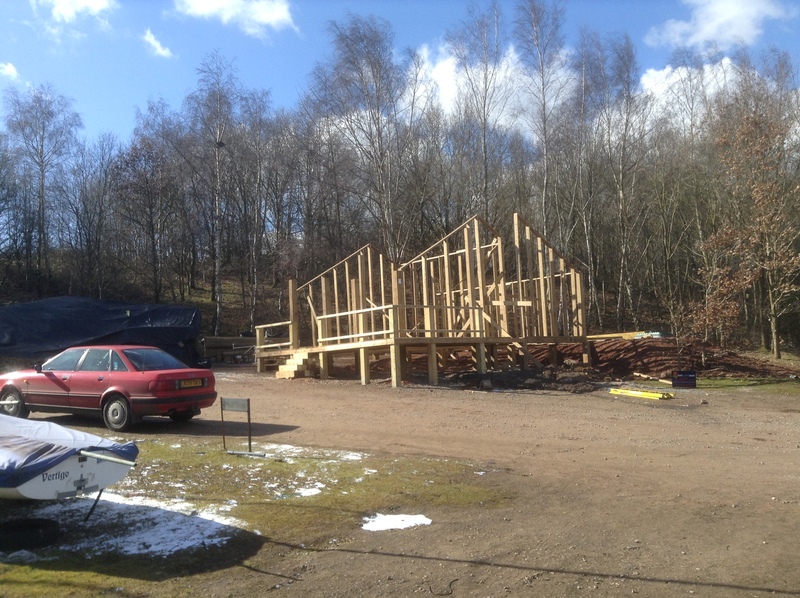 This week all the cladding has gone up and work has began on the inside. 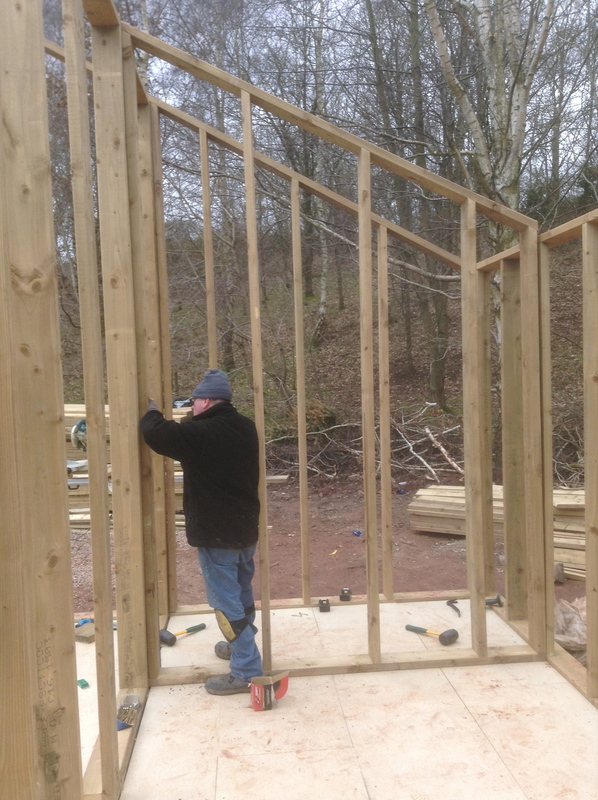 The insulation has started to be put in, all the window frames, door frames and doors have been put in, and the spaces are starting to look real. The training centre is beginning to come together, with two weeks until the opening i hope next weeks update will be longer. 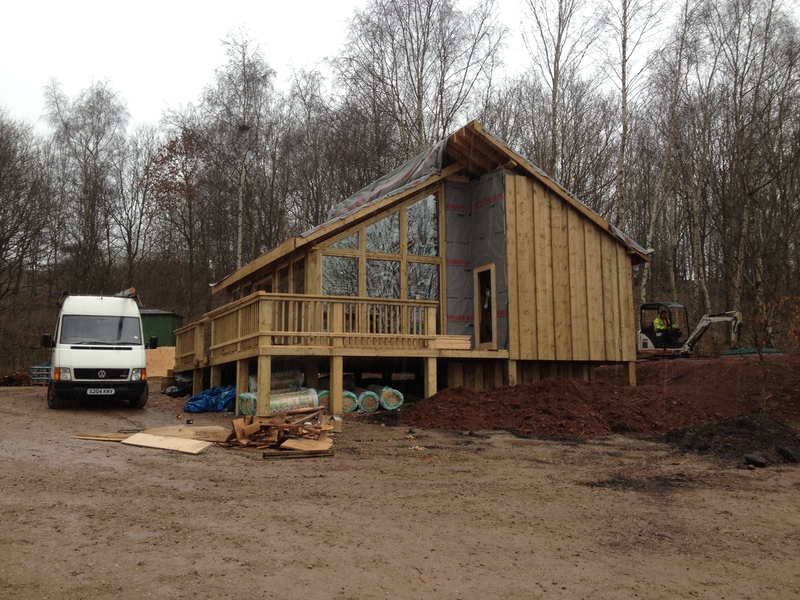 We expect the glazing to go in midweek, so im looking forward to my site visits this week. This weeks progress is noticeable. 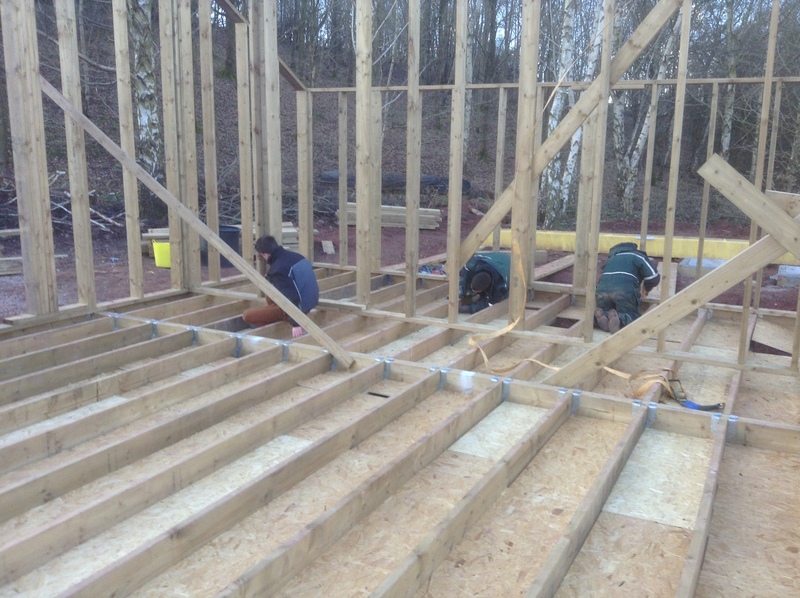 The roof rafters were cut and positioned and the roof was sheeted with plywood. 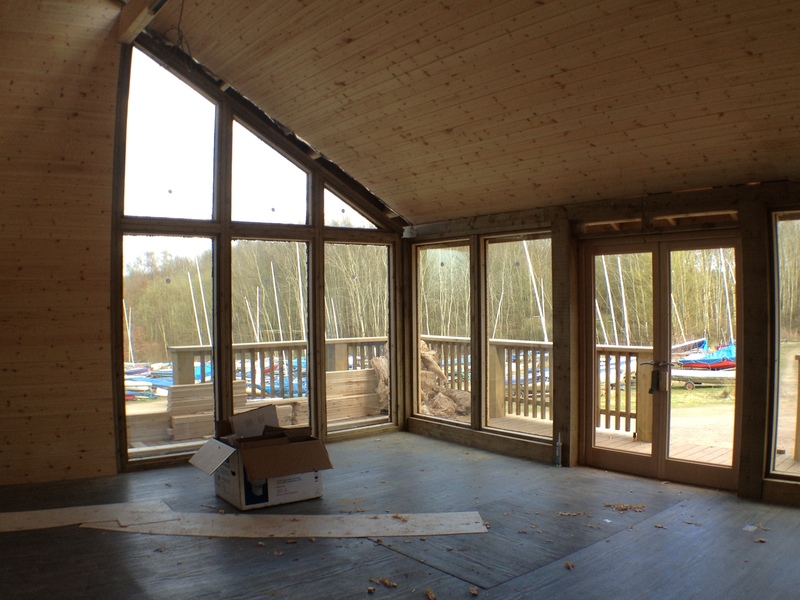 With the roof taking shape, you really start to get a feel of the training centre inside and out, i am pleased with how lovely and bright the interior is. 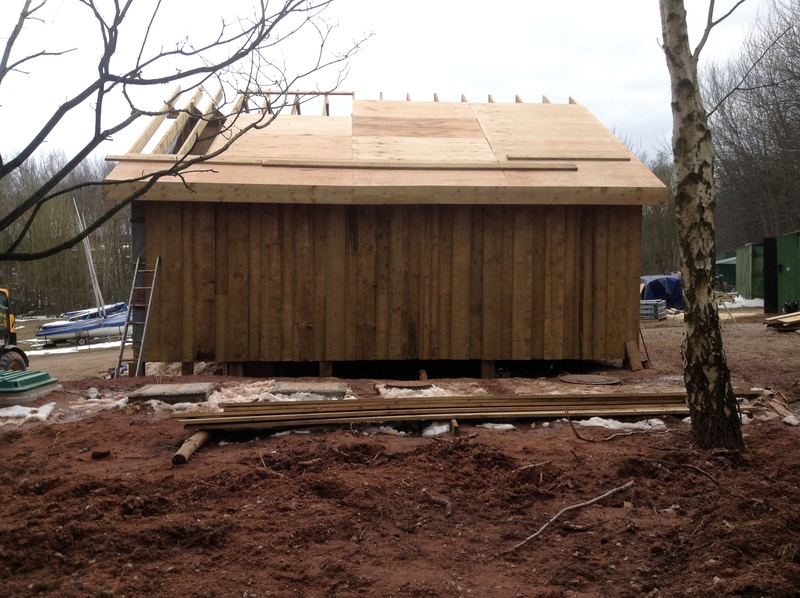 The vertical hit and miss cladding has started to go up, and is looking lovely. 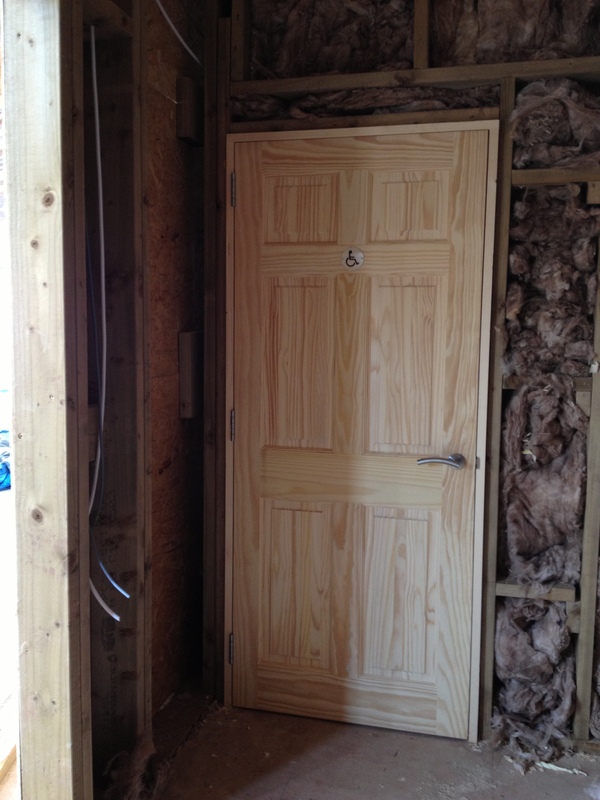 The electricians have finished the first fit and all the door furniture has been chosen and ordered. This week there has been some design discussion about the disabled access ramp and the entrance stairs, the committee have approved the design change to make the access ramp larger and follow the shape of the building down the west wall. This change means that the veranda from the south side will be symmetrical. It also creates better disabled access and allows for a garden space to be created on the west side. The main entrance stair will also be on the south side with the east stair case being omitted due to height and cost reasons. Progress this week has been impressive and i am very happy with it. 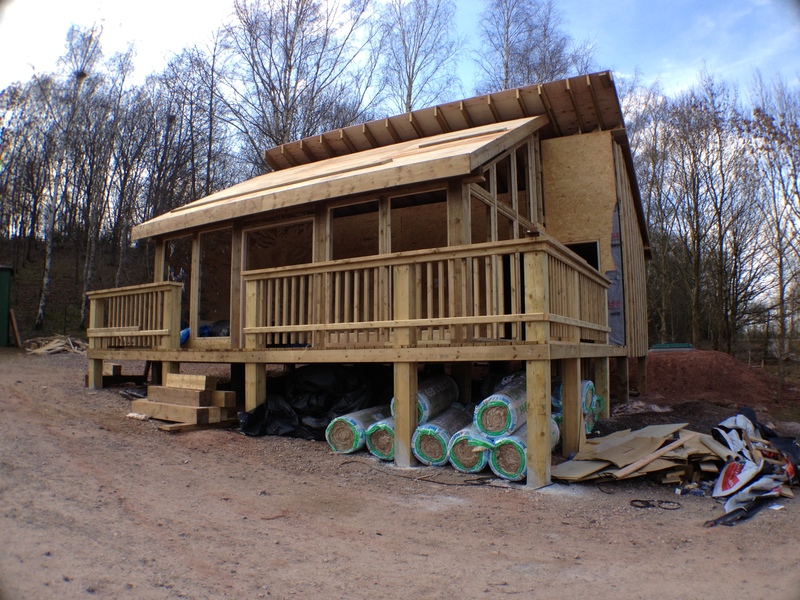 From wednesday 3rd April i will be taking over the role of project manager and overseeing the build until completion, which i still hope will be in time for the opening on the 20th April. 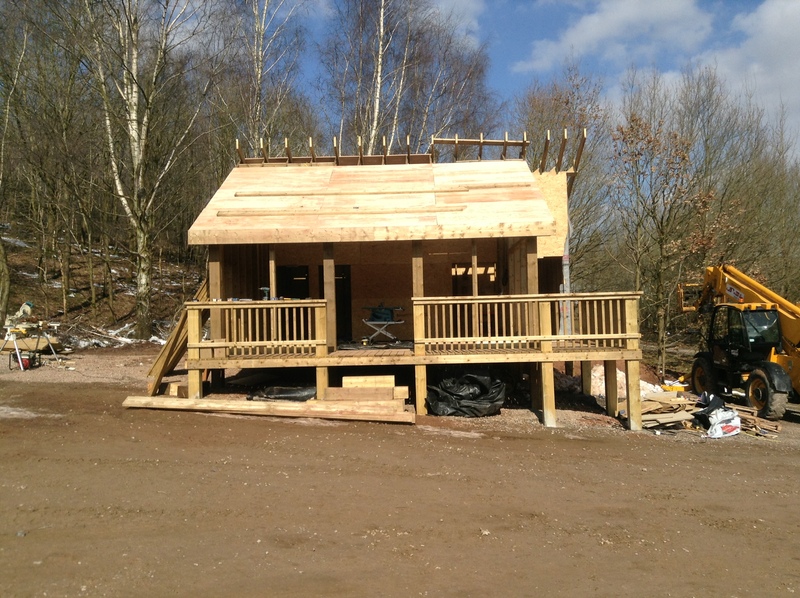 At the end of week 5 there is now only 4 weeks left to the official opening. Tracy Edwards, MBE, Around the world yachts women has been confirmed to open the training centre on the 20th of April, the opening coincides with the RYA Onboard festival which is aimed to promote sailing to children. Lets hope its finished in time! This weeks progress has again been good. The Perlin has been lifted in to place and the windows have been framed out ready for glass to be ordered. The Perlin was quite difficult to lift in to place and took 3 attempts with different techniques to finally position it. 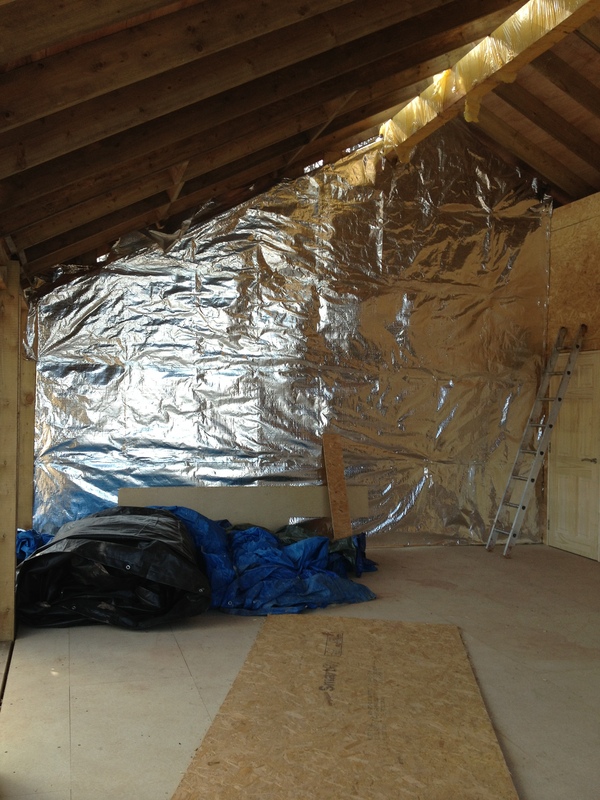 The OSB on the outside has been sheeted with a breather membrane. The internal particians have been partially clad and the electrician has started work with first fit of the cabling for the 240 volt system. 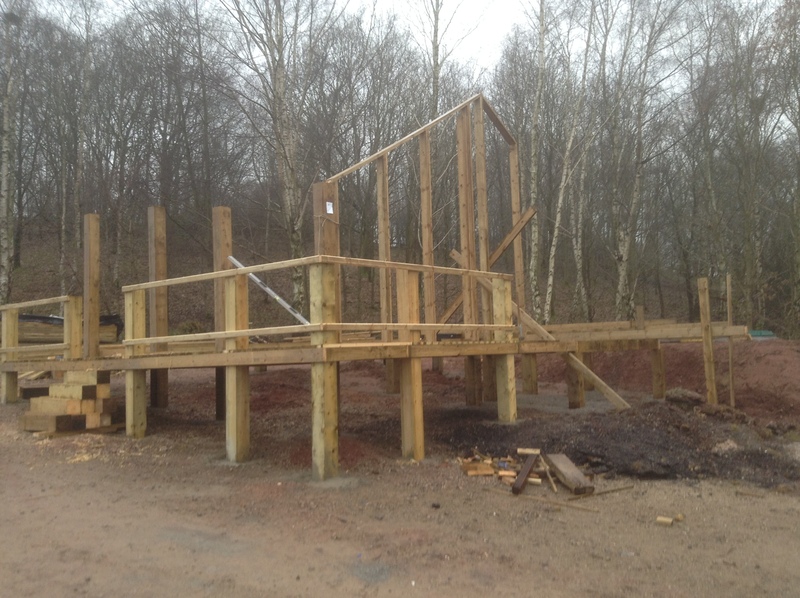 The first rafter has been measured and put in to place in preparation for the remaining to be positioned next week. It was a really enjoyable visit today, as progress this week has been incredible. 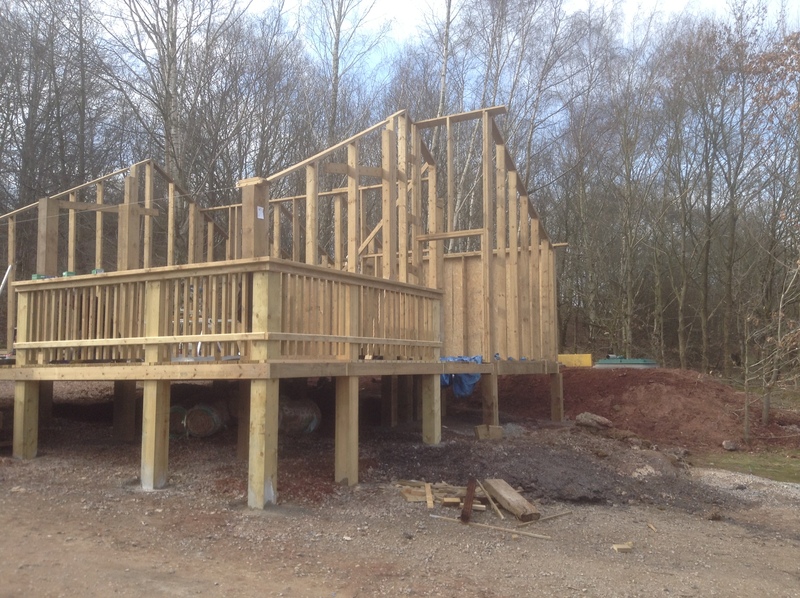 This post has photo updates from each day this week to show the considerable progression. 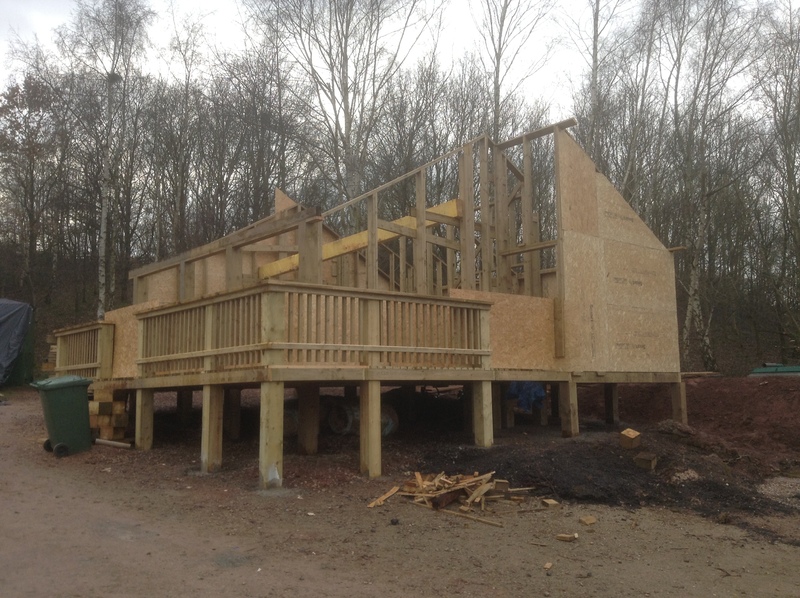 The the main external frames were positions and the subfloor fitted. 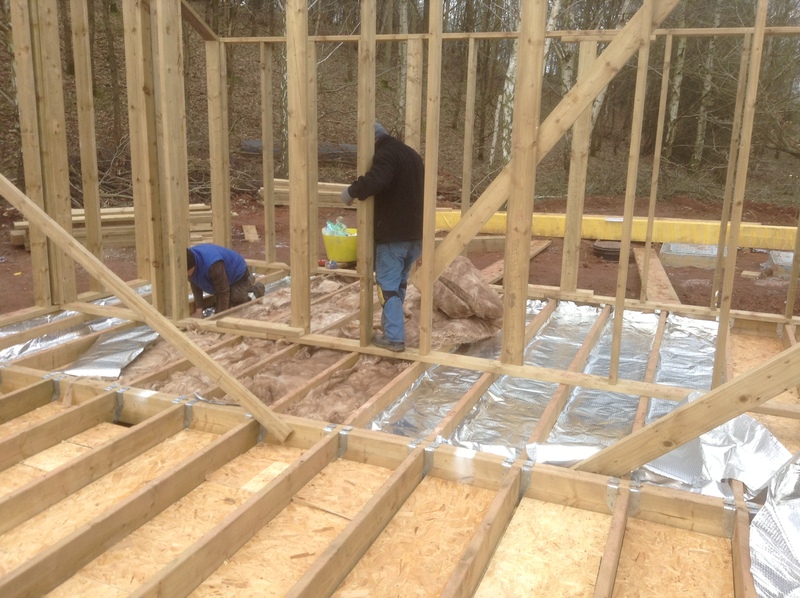 The floor insulation and floor board fitting began and the internal partition walls were positioned. 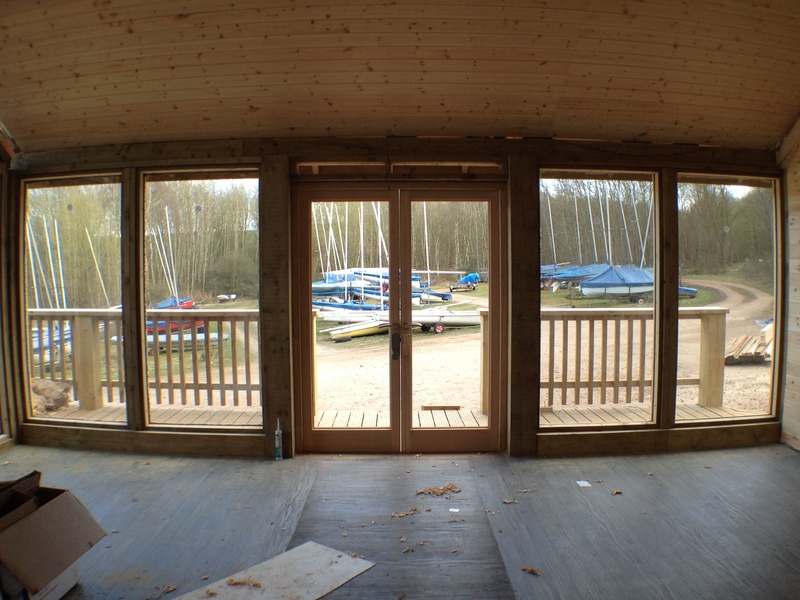 The rest of the floor was completed, and all the internal frame works were fitted and secured and the door openings were created. 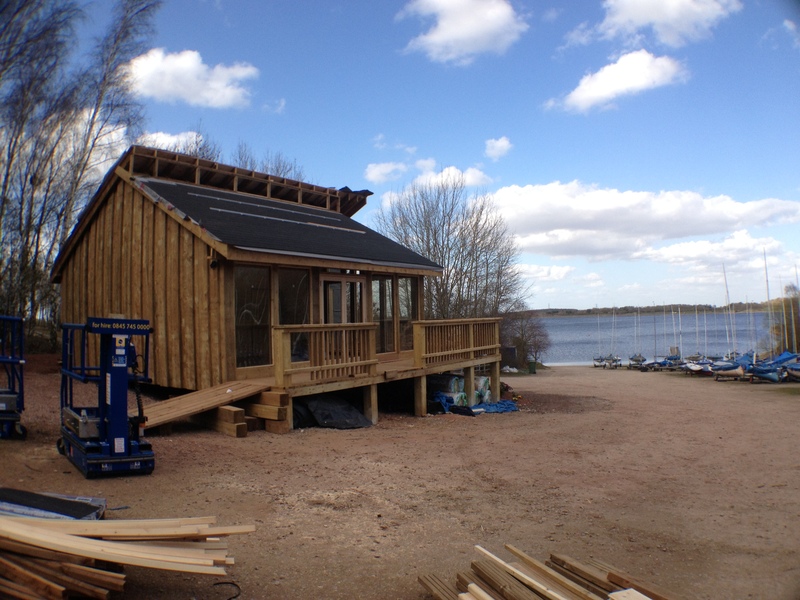 The veranda was completed, and they began fixing the OSB cladding. 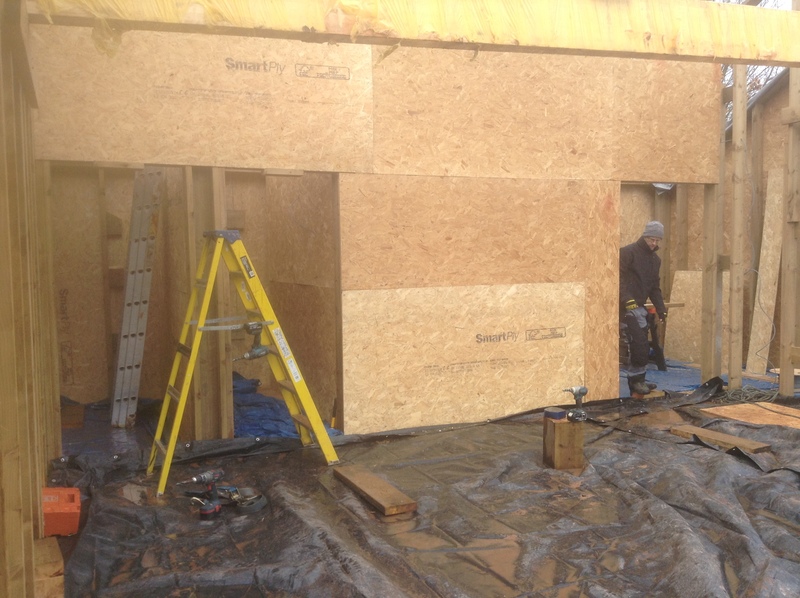 The rest of the OSB was put up. 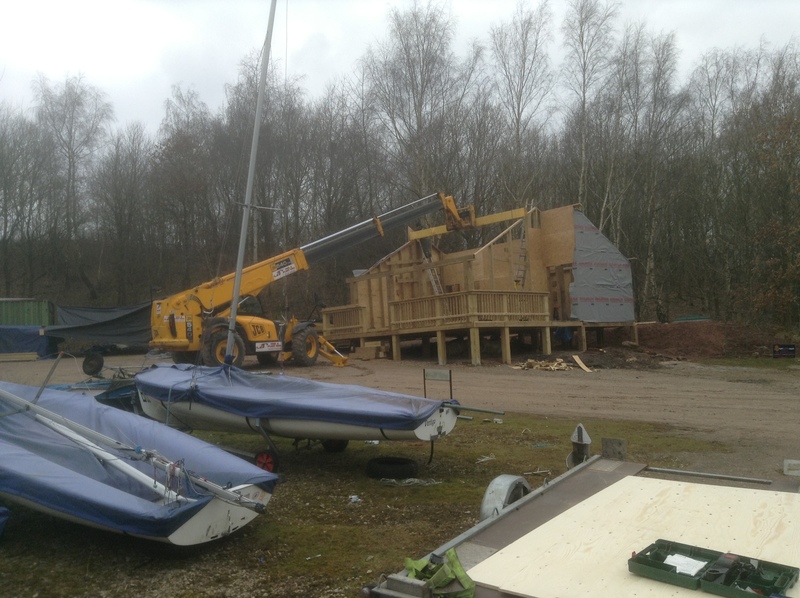 The pillars were trimmed and the south wall plate positioned and the glulam purlin was partially lifted into place. 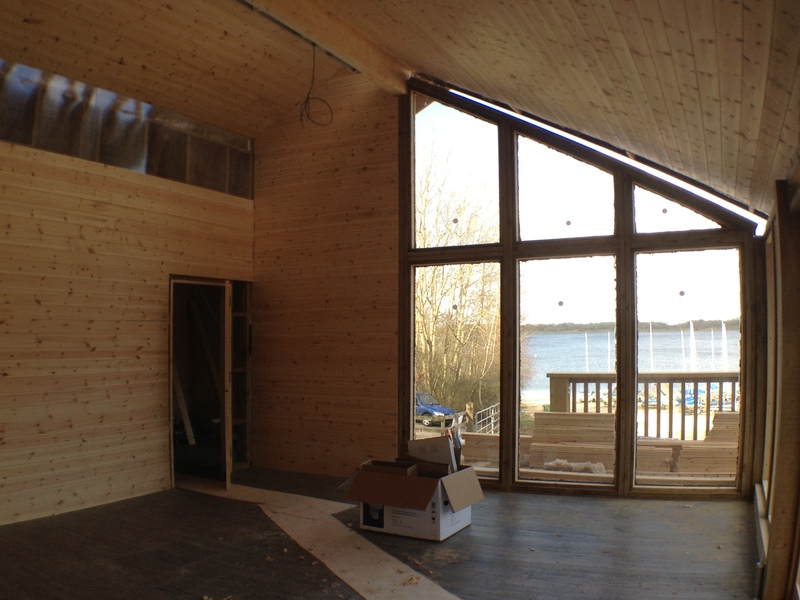 As the building is being enclosed you really begin to get a feeling of the airy large interior, and the views that are framed by the chunky wooden frame are really looking nice. As i got a bit excited and posted a construction week 2.5 , this post becomes a bit short on progress information. 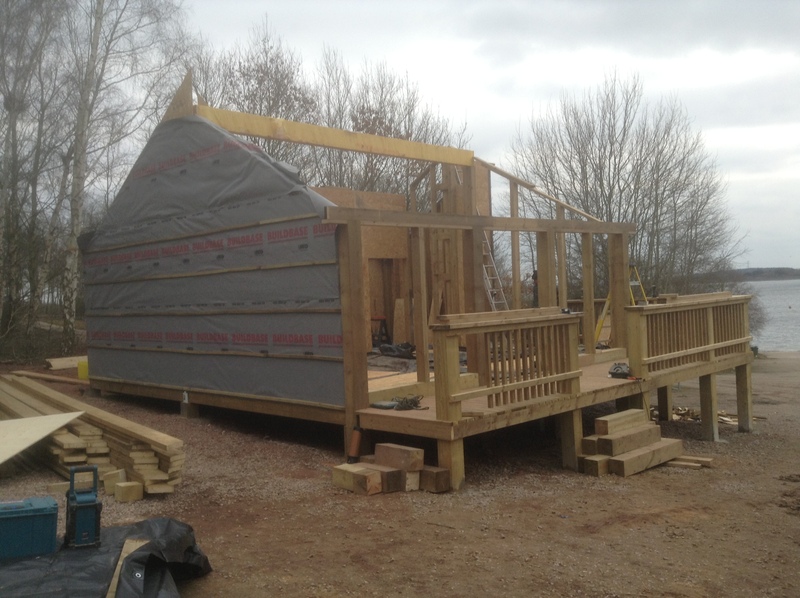 However, the veranda is now completed with It’s decking, all the wall frames have been fabricated and one has been positioned. 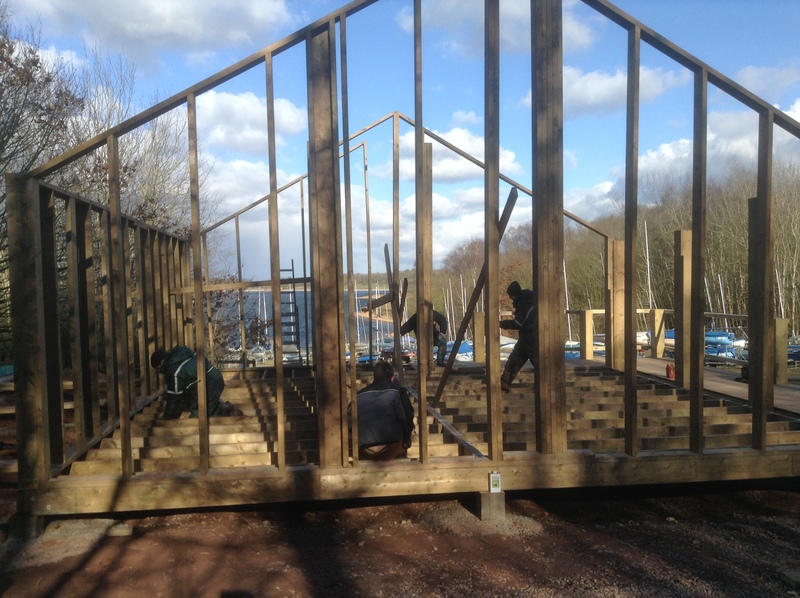 Quite a lot of work has been spent preparing timber for next week and we hope there will be more manpower next week, soon we hope to see the frames erected with cladding and the roof going on. Here is the latest photo taken on friday 8th march in the fog. Next scheduled visit 16th March. 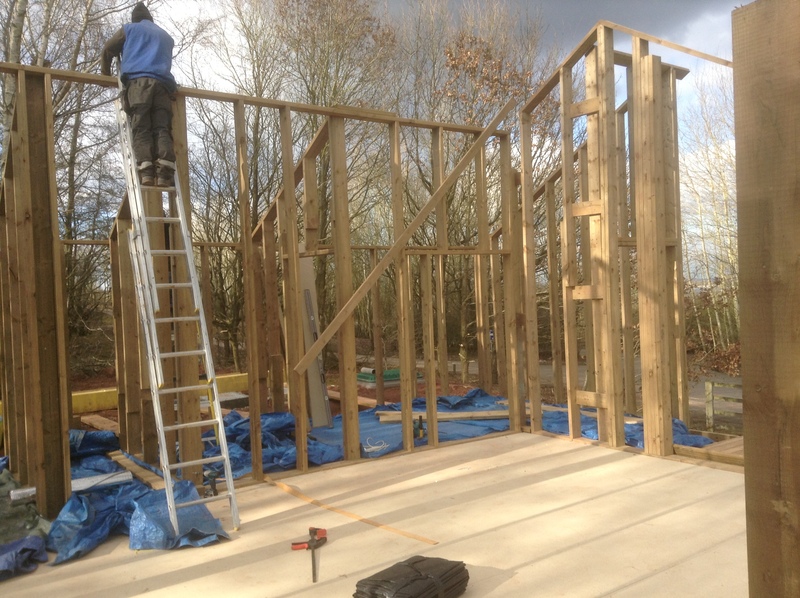 Today the first wall frame was erected. The shape and scale of the building is really starting to take place. I just couldn’t wait for construction week 3 progress to post these photos.